Paris, Ensba, no. 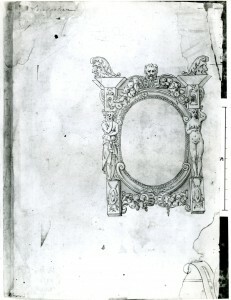 1628 verso (formerly lot no. 22787 verso). Pen and ink and wash, 28.2 x 21.3 (the drawing itself occupies only about one-fourth of the sheet).2 Inscribed in pencil beneath the drawing: Primatice, and in ink, in the lower left corner: Primaticcio; in the upper left corner, in pencil: Lesoufacher. The sheet is torn at the upper right and repaired, slightly ragged along the right edge, and stained in the upper and lower right corners, the upper stain crossing the upper right corner of the drawing. PROVENANCE: Gift of Le Soufaché in 1891 (see Béguin below). Béguin, in EdF, 1972, 187-188, under no. 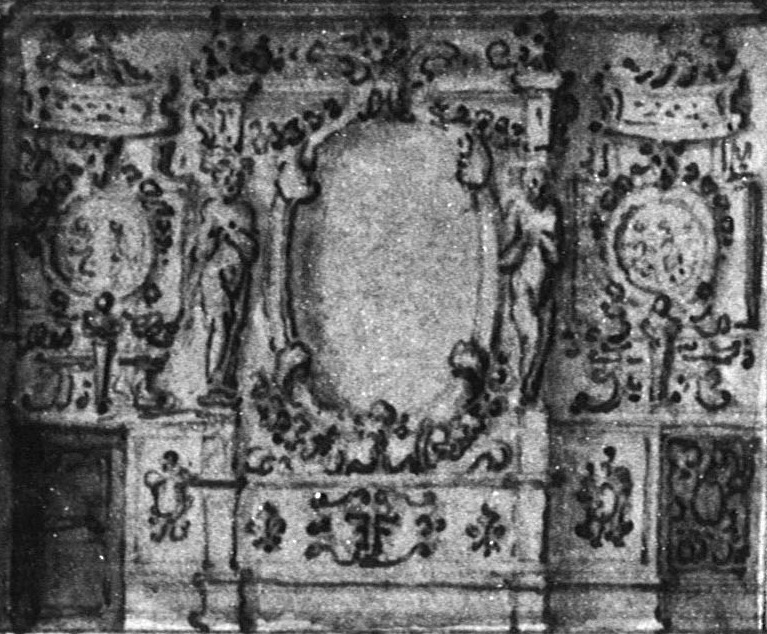 213, mentioned that according to Carroll the drawing reproduces the central part of the now destroyed decoration of the East Wall of the Gallery of Francis I.
Carroll, 1987, 227, n. 3, as a copy of a lost drawing by Rosso for the East Wall of the Gallery of Francis I.
Béguin, 1989, 831, as related to the lost decoration of the East Wall of the Gallery of Francis I.
Brugerolles and Guillet, 1994, 42-45, Fig., no. 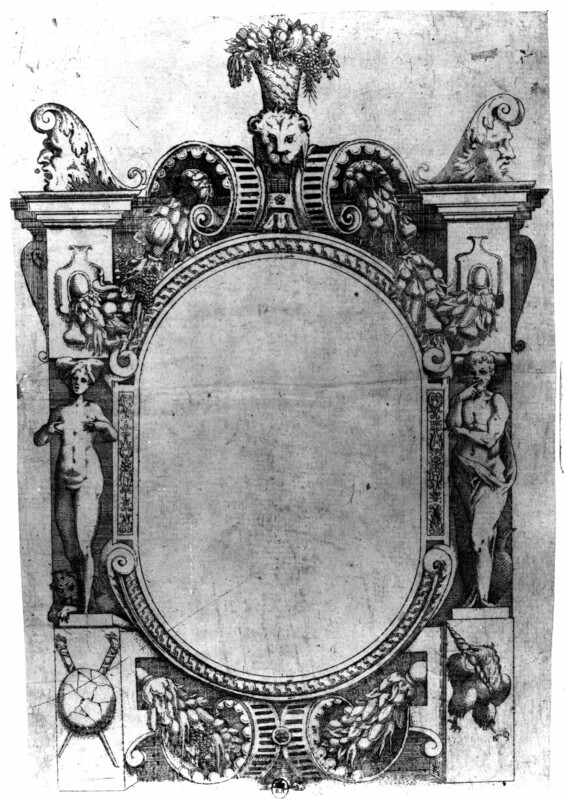 16 verso, as shop of Rosso, for the East Wall of the Gallery of Francis I. 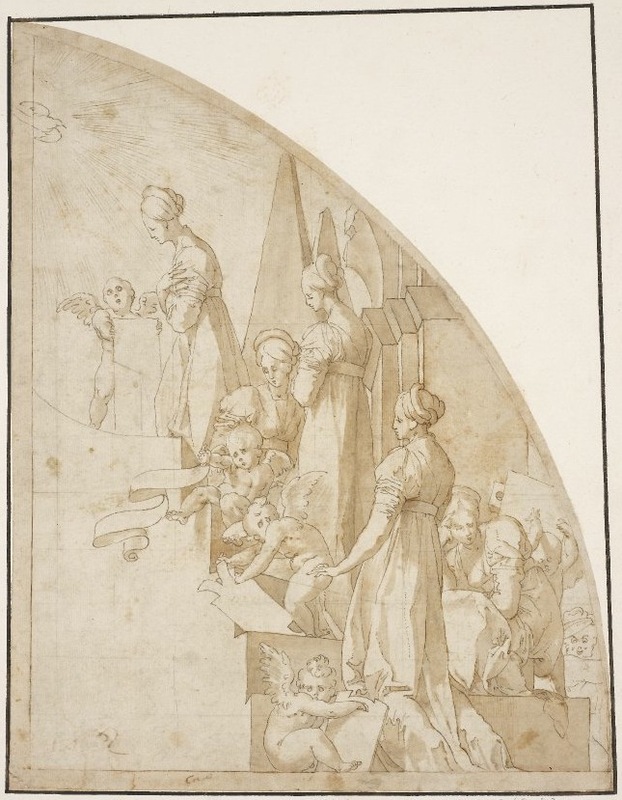 As discussed in P.22, East Wall, and in Chapter VIII, this drawing is a copy of a lost drawing by Rosso for the stuccowork of the lost decoration of the East Wall of the Gallery of Francis I. The drawing shows only the central part of the wall, as known from d’Orbay’s drawing of 1682 (Fig.d’Orbay drawing a), and shows it slightly different, most significantly by an entablature running all the way across the top of the frame with the lion’s head placed above it. In d’Orbay’s drawing, the standing figures at the sides of the blank oval seem to be the same, while in the Ensba drawing, the figure at the left is male and the other female, and they have different postures. The oval is also taller in d’Orbay’s drawing. In the Ensba drawing, the small pieces of entablature beneath the masks at the ends of the top of the frame are only adumbrated and have no architectural detail. 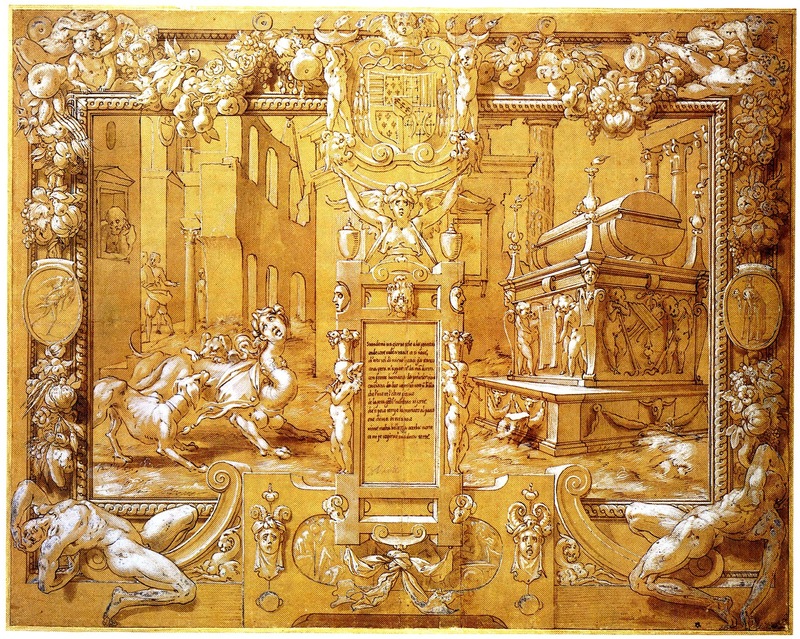 This kind of schematic rendering of architecture appears in Rosso’s Allegory of the Virgin as the Ark of the Covenant (Fig.D.33Aa) and in the drawing of Rosso’s early version of the Scene of Sacrifice (Fig.D.50A). This and other details indicate that the drawing was not derived from what appeared in the gallery. 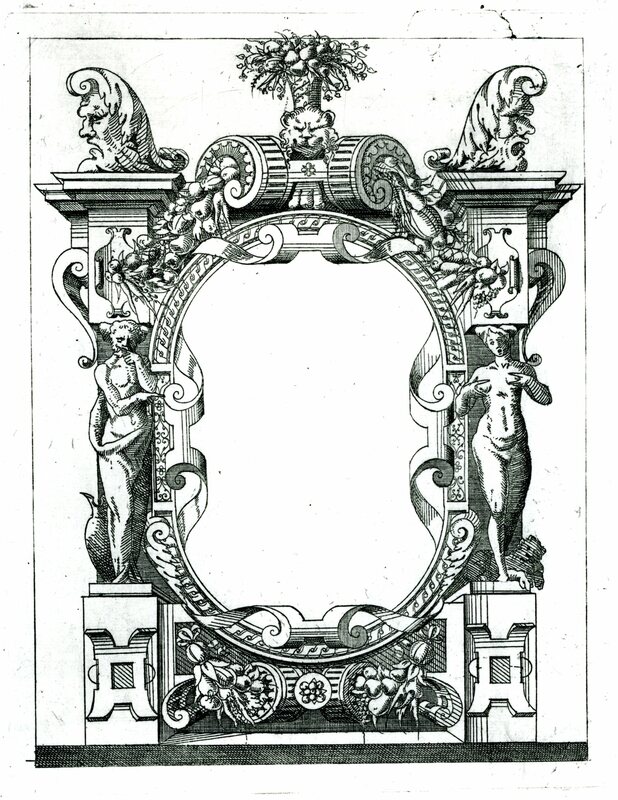 It was also not copied from either Fantuzzi’s or Du Cerceau’s prints of a similar frame (Fig.E.67; Fig.E.57,11). The drawing must be a copy of a lost drawing by Rosso, the design of which was changed primarily, judging from d’Orbay’s drawing, in order to accommodate the frame to the slightly higher area for it in the gallery. The penmanship of the copy resembles that in Rosso’s Petrarch drawing (Fig.D.47a), although the copy lacks the precision of that drawing. 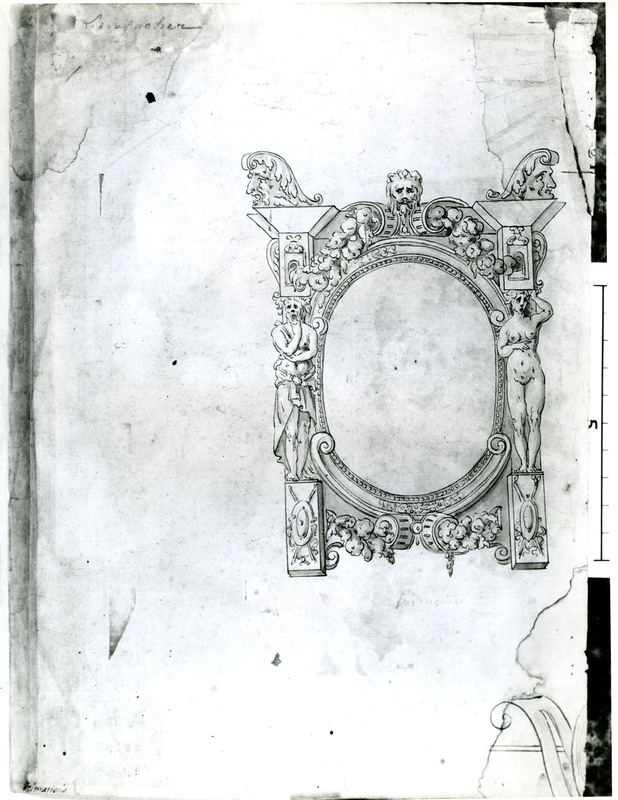 In the copy, the decoration of the small inner molding of the frame at the top and bottom is incomplete; it cannot, of course, be determined if this was true also of the lost original drawing. The washes are very perfunctorily applied, although their disposition is consistent with the fall of light from the upper left. One might wonder if the copy represents all of the composition that was shown in the original drawing or only the center section of a drawing showing the entire decoration planned for the East Wall, although quite possibly without its oval painting being represented. 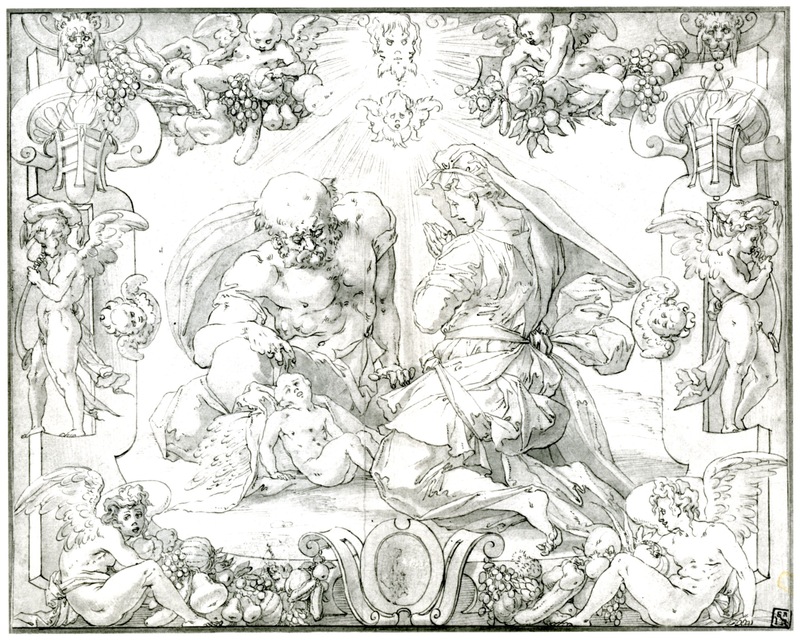 But the copy gives no indication at all of a larger design and in this respect resembles Fantuzzi’s etching and the modified copy of it by Du Cerceau. D’Orbay’s drawing presents a composition of the East Wall that is divided into three very distinct vertical parts, so it is very likely that an independent drawing was made for the central section. The central oil painting of the East Wall was, according to Vasari, done before Primaticcio arrived in France, indicating most probably that the entire scheme of this wall dates from the earliest phase of Rosso’s activity with the designs of the decoration of the gallery. 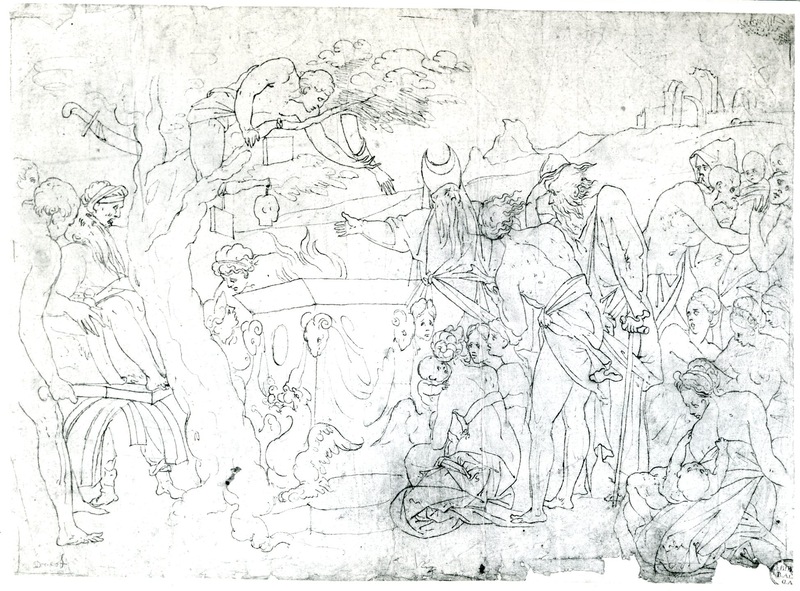 The small forms that appear in d’Orbay’s drawing and in the copy of Rosso’s drawing also suggest an early date for the design of the East Wall, meaning that the lost drawing would have been done between c. 1531/1532 and 1534, when the stuccoers began to work in the gallery. 1 For the recto of this drawing, see RD.27. 2 At the lower right of the sheet is part of a decorative unit, cut by the right and bottom edges of the sheet, composed of a volute with a slit down its center, a circle or oval, and a molding. There is also a very small circle motif at the upper right cut by the right edge of the sheet. The latter is too fragmentary to make out what it is. The other motif is found at the bottom of Rosso’s Holy Family in a Cartouche (Fig.D.75C).